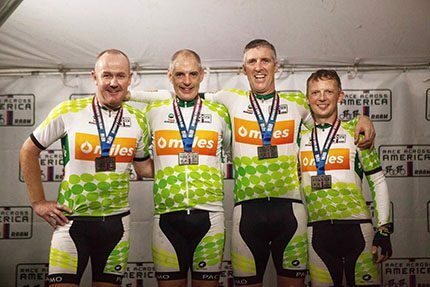 Four men from Donegal have completed the toughest cycle race in the world – The Race Across America (RAAM) – in just seven and a half days! Taking part were – Milford native, Arthur McMahon of Donegal Oil and his team mates – Padraig MacGinty from Downings, Convoy’s Gavin Harris and Gerard Callaghan from Letterkenny. The first ever team from Donegal to take part in this ultra-endurance cycle race, the four were also proud to be the only team to be representing Ireland this year. The cycle race spanned over 3200 miles across 12 US States from the east to west coast of America. The race started in Oceanside, California where the team endured extreme weather conditions from intense heat through the desert, to lightning and rain storms with a severe tornado in Kansas. The team was overwhelmed by the support and well wishes received from home, family and friends from across the world and would like to thank everyone who has donated to their autism charity. “Every cent of the money raised will go towards providing schools, sports clubs and charities with educational aids for children and adults on the autistic spectrum,” said Arthur McMahon.